A Tractor in GTA San Andreas. The Tractor is, as implied, a tractor in Grand Theft Auto: San Andreas and Grand Theft Auto V.
The Tractor is generally designed as a simple, open air, farming tractor with large driving wheels in the back and a pair of steerable wheels in the front. Like the Combine Harvester, the Tractor is simply not well suited for use as an actual road vehicle. Their incredibly slow speed makes them a particularly insidious road hazard in San Andreas, and a common cause of accidents and pile-ups. However, the Tractor is capable of hill climbing on moderately steep slopes, but is considerably slow in doing so. Its smaller front wheels also makes the Tractor less responsive during steering due to lesser traction. Despite its unsuitability for travel on major roads, the tractor is commonly found on large thoroughfares, in the countryside and even along highways. The Tractor has a semi-unique ability to tow a car from one point to another, something it shares with the Tow Truck (and Baggage, to a degree). This is very useful when transporting locked cars, or special vehicles in the game. The Tractor also has its own trailer, called the Farm Trailer. Like most industrial vehicles, the Tractor cannot be modified in any modification garages. The Tractor in GTA V is significantly older than its GTA San Andreas counterpart, and is completely coated in rust. The default radio station in the Tractor in GTA San Andreas is K-Rose. 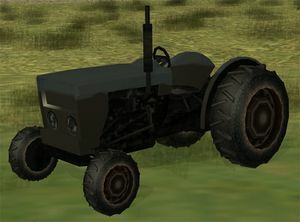 The Tractor in GTA San Andreas is depicted as having a three-point hitch at the back, although it serves little purpose in-game as the towing hitch is not connected to the mechanism. The Tractor in GTA V is one of only a few non-civil service vehicles in the game without a radio. Sometimes, in car parks in Red County, tractors spawn facing walls. The NPC in the tractor keeps ramming the tractor into the wall until it blows up. When towing large vehicles with the Tractor in GTA San Andreas (such as Tankers or Roadtrains), the vehicles will glitch up and fling themselves around at very high speeds. In GTA V, the Tractor has the Stanley logo on its grille, although unlike most vehicles the manufacturer name does not appear on the HUD with the vehicle's name upon entering. In a field west of Palamino Creek, near the broken bridge. Tractors are found around Flint Range. In the western portion of Blueberry Acres. In a field northwest of Hilltop Farm. Two are found around the Flint County Safehouse. Parked in a farm between The Farm and Foster Valley, San Fierro. In a patch of grass north of Leafy Hollow and east of the Flint County Safehouse. By Ursula's home in Cape Catfish. As a reward for delivering the money in the mission Unknowing the Truth. This Tractor has a unique "KIFFLOM1" license plate. This page was last modified on 4 May 2014, at 22:40.